This is the second part of some basketball shooting drills from the Xavier Men’s Basketball Newsletter. Shoot in partners. One partner completes the whole cycle and the other partner rebounds. They switch. There are five spots on the court–corners, wings, and top. The shooter takes a jump shot, a shot fake–one dribble pull up, and a shot fake-one dribble–then a dribble move to beat a helper in for a layup from each spot. That means three shots starting from each spot. The shooter gets 2 points for each make for a total of 30 possible points. The last two possible points come from shooting 2 free throws at the end. Winners get a reward or losers run or do pushups. It is essential to teach finishing at the basket as a part of your shooting work. I like this drill for it. Put one minute on the clock. Players start at the right elbow at each basket. Player dribbles in with right hand and finishes on right side. Catch the rebound, dribble out with left hand to left elbow, jump stop, pivot and face the basket in triple threat stance, Attack basket on left dribble and finish with left hand. Players keep track of makes in the one minute time. Work on different kinds of finishes, running layup, 2 foot power layup, reverse, and any other finishes that you teach. 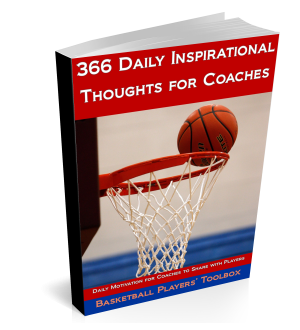 When players are shooting free throws, have them keep track of how many they make in a row. When they shoot in partners, they shoot until they miss and then switch. Have players record their streaks to track their progress. This drill really helps concentration. I like to display the top ten longest streaks on a board in the gym. When we started doing this, we had some 10s and 12s. I had a player in the summer who went nuts for this. We would get done with summer workouts and 9:00 pm and he would still be there at 10:00 shooting his streaks. He ended up being the only one on the board with all 10 top streaks. Most importantly, it showed during the season. How you do the drill is determined by how you teach pivoting.Player start under the rim. A passer/coach starts at the volleyball line. Players pass to the coach and sprint towards their pass. As they do, the coach at the volleyball line passes the ball back and shouts a direction. Players must pivot in that direction and shoot. The drill makes players work on pivoting and shooting. Great drill.